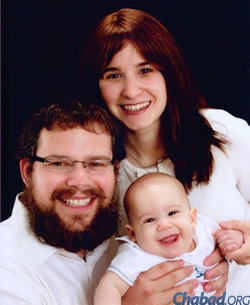 Why would Rabbi Yossi and Mushka Greenberg, along with their 10-month-old son, leave their Chassidic community in the Crown Heights neighborhood of Brooklyn, N.Y., to move around to Miami University in Oxford, Ohio? To establish a Chabad on Campus center, of course! Just one month ago, the Greenbergs packed up their belongings, said goodbye to their friends and family, and relocated to a place where they knew no one—simply because they felt they were needed there. The Greenbergs are co-directors of one of about 200 full-time Chabad on Campus centers worldwide, with an additional 200 universities served with part-time programming for Jewish students. Even though the young couple just moved and barely have had time to unpack, their doors are already wide open, offering Shabbat meals on Friday nights and Saturday afternoons for students, as well as classes, one-on-one learning sessions, social events, and philanthropic and volunteer opportunities to help others in need in the community. Just last month, they co-hosted with Hillel a very successful public menorah-lighting for the festival of Chanukah. The event took place in the center of Uptown, and was attended by community members and students alike. 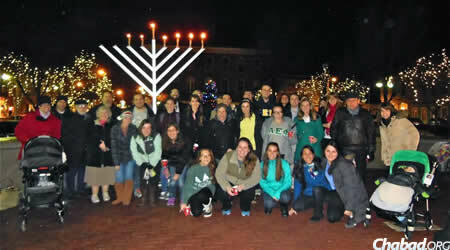 Just having arrived at Miami University in Ohio, tthe Greenbergs and the Hillel Foundation co-hosted a successful public menorah-lighting, which was attended by community members and students alike. The Greenbergs will also focus on encouraging students to take leadership roles in their campus communities to help foster the creation of the next generation of empowered Jewish leadership. The first Chabad House on campus was established in 1969 with the encouragement of the Rebbe—Rabbi Menachem M. Schneerson, of righteous memory—to serve a growing need for advice, support and Jewish educational opportunities for students. “College is a transitional time in a student’s development, and often when one’s values, goals and identity start to solidify. It is essential that Jewish students have access to experiencing and learning about the richness of Judaism so that their Jewish identity will be able to flourish as well,” said Rabbi Yossy Gordon, executive vice president of Chabad on Campus International Foundation. The Greenbergs hope in the future to be able to purchase a building, as currently all programming is based out of their home, just minutes from campus. But their immediate focus is meeting new students and getting them involved in the various opportunities and programs that Chabad on Campus at Miami University has to offer.